Spread each tortilla with 1 1/2 teaspoons of the sandwich spread to within 1 inch of edges. Top with cheeses, cucumber, bell pepper and alfalfa sprouts. Roll up each tortilla. Wrap in plastic wrap. 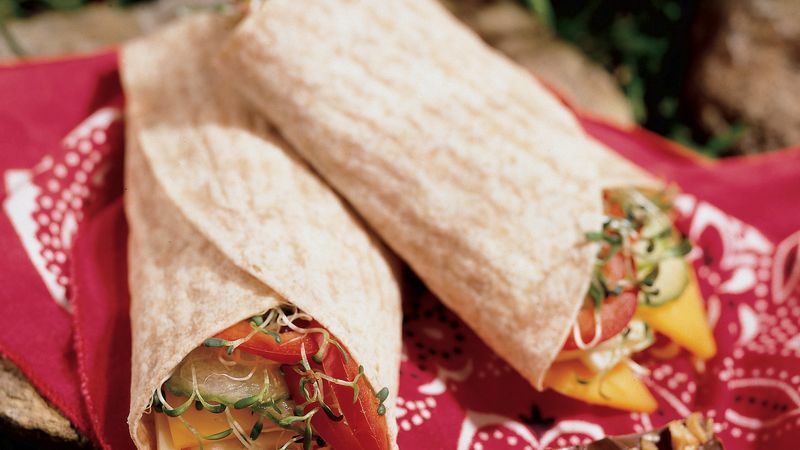 A popular food trend perfect for dinners on-the-go, wraps consist of flavorful ingredients enclosed inside thin flatbread-type wrappers such as tortillas and pita bread. Wraps create a practical, hand-held meal. Red peppers, which are fully-ripe bell peppers, not only add a splash of vivid color but a greater amount of vitamin A than green or yellow peppers. They are also an excellent source of vitamin C.